After traveling to Japan twice already, I knew exactly what I was getting into when I was planning for this trip. I prepared as much as I can, always on the lookout for the best rates, working out a budget that would let me enjoy certain luxuries, while keeping the costs down, I’m quite happy to find out that I’m able to keep this trip way below what I spent during my first trip to Japan. Maybe the cost can be attributed to a weaker yen (or a better performing peso), but I like to think I maintained better control of my personal spendings this time around. I indulged in a bit of shopping, but the most extravagant thing I bought was a ceramic knife. No more toys for me this time around. No Kit Kats either. It definitely helped that I shared the cost of most of my accommodation with friends, and the fact that I relented to going back to the dorms. Hostel dorms in Japan (at least the ones I’ve been to) are really nice. What savings we had there though, were put towards more upscale accommodations in Magome and Iwami. We stayed at a minshuku in Magome, and a huge suite in Iwami (probably given to us when they found out Khursten went there all the way from Australia just to fangirl), both with inclusive dinner and breakfast. 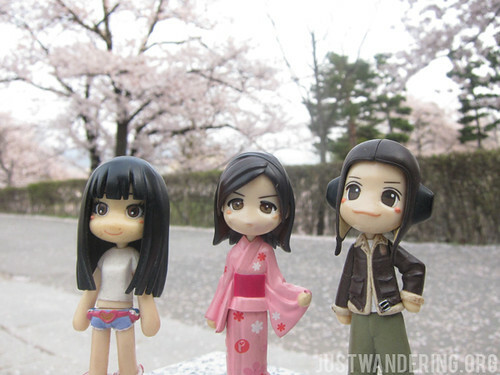 Japan is still not the cheapest destination, but with careful budgeting (and some saving up), it’s definitely doable! 2 Bought from Attic Tours as well. Best to pay with peso, rather than dollars (hence my bloated rate). 3 Subways and private railways not covered by the JR Pass. This includes the ¥ 1,820 fee (one-way) for the stretch between Chizu and Kamigori, and the one-day Kishi pass to visit Tama, the Super Station Master Cat. 4 No choice but to get a cab to get to the Dai-o Wasabi farm from the Hotaka station (and back), and from our hotel in Iwami to the station. 5 J-Hoppers Kyoto, triple room (shared bathroom), split with Ron. 6 Magomechaya, 6-tatami mat room (shared bathroom), dinner and breakfast included, shared with Ron and Sunshine. 7 Matsumoto Backpackers, 4-bed dorm upgraded to private traditional room (shared bathroom), split with Ron and Sunshine. 8 toco Backpackers Hostel, 6-bed female dorm (shared bathroom). There was a mix-up with my booking, as we had a misunderstanding about my check-out date. They booked me for my last night at a nearby budget hotel at no extra cost. 9 U-en Guesthouse, 4-bed female dorm (shared bathroom). 10 Guesthouse Kaine, private traditional room (shared bathroom), shared with Khursten. 11 Seaside Uradome, private traditional room, with seafood dinner and breakfast. 12 Borrowed a friend’s Suica card, ended up losing it, so cost tripled to compensate for the cost of the card (¥ 2,000) and the existing balance (¥ 1,740). 13 Delivery of one luggage from Tokyo to Kansai Airport. I love how organized your presentation of travel expenses. Also, the accommodation s in Japan are really expensive, from the fact that your rates are based on dorm/room sharing already. Thanks for sharing these deets! As Gael mentioned, you can try Couchsurfing! Or maybe you know somebody who lives there? Definitely check out Hostelworld, because there might be cheaper options, since I make it a point to pick hostels near the city center. You can also check out Airbnb, just in case! OMG! ang mahal ng accommodation, dorm na yan ha! Looking to visit Japan in autumn for my birthday trip pero mukhang d kaya ng budget ko. matinding pag-iipon ito, mag couchsurfing nlng siguro ako sa mga friends. hehe salamat Nina, very helpful! Maghana na para sa Japan! Nina – WOW! You were able to list down everything!! Ang galing mo!! We also got out flights from the Travel Fair hehehe.. Super love the travel fair talaga!! Next year ulit!! Wow. That hurts the budget big time. But I guess the experience is all worth it. Travelling in Japan is a very nice experience. So if you want to visit and have a vacation in Japan, you can go to our website: http://his.com.ph/en/en-index.html to see our affordable package tour price! Also, fill-up our inquiry form for us to easily assist you! Thank You! There are some really cheap hotels in Tokyo. I have been in one for 30$ per night. Japan is not the most expensive country, indeed. Best regards!